Hand sliced mozzarella hand dipped in our signature beer batter. Calamari steak strips served with tater tots and sprinkled with shredded parmesan cheese served with tarter & cocktail sauce. Hand sliced fresh chicken breast, hand breaded in our signature breading. Fresh sliced onion hand dipped in our signature beer batter. Topped with apple wood smoked bacon and shredded sharp cheddar cheese. Choose from oven roasted, BBQ, teriyaki or traditional buffalo. Topped with parmesan cheese & served with Sriracha ketchup. Homemade dressings: ranch, blue cheese, Italian, caesar, 1000 island and house vinaigrette. Craisins, fresh walnuts, sliced apple, and feta cheese on mixed greens. Hard boiled egg, shredded parmesan cheese and mixed greens with croutons. Mixed greens topped with red onion, tomato, apple wood smoked bacon, turkey, avocado, hard boiled egg, and blue cheese. Mushrooms, black olive, tomato, mixed greens, and feta cheese. Salami, Canadian bacon, black olive, tomato, shredded mozzarella cheese on mixed greens. Substitute fresh spinach in any salad at no additional charge. Our burgers are made from fresh (never frozen) Angus chuck. They are hand pressed and come with a choice of natural cut french fries, side salad, veggies, chili, or clam chowder. Cajun seasoned 1/3 pound burger topped with blue cheese and apple wood smoked bacon with lettuce and tomato. Double 1/4 pound patties with double American cheese, pickles, and lettuce smothered in our famous Rock Sauce. 1/3 pound burger topped with tomato, red onion, lettuce, and served with mayonnaise. 1/4 pound burger topped with our house made BBQ pulled pork and double American cheese. Double 1/3 pound patties, grilled green chile, apple wood smoked bacon, mozzarella cheese, Sandy's chili, jalapeño bottle caps, red onion, tomato, and smothered in our famous Rock Sauce. Local favorite burger, 1/3 pound burger, apple wood smoked bacon, mozzarella cheese, avocado, lettuce, tomato, red onion, and smothered in our famous Rock Sauce. 1/3 pound burger with apple wood smoked bacon, hand dipped onion rings and smothered in BBQ sauce. Vegetarian burger made with Beyond Burger brand vegan patty with cheddar cheese, mayo, lettuce, tomato, onion, and avocado. We use Hebrew National all beef 1/4lb hot dogs. 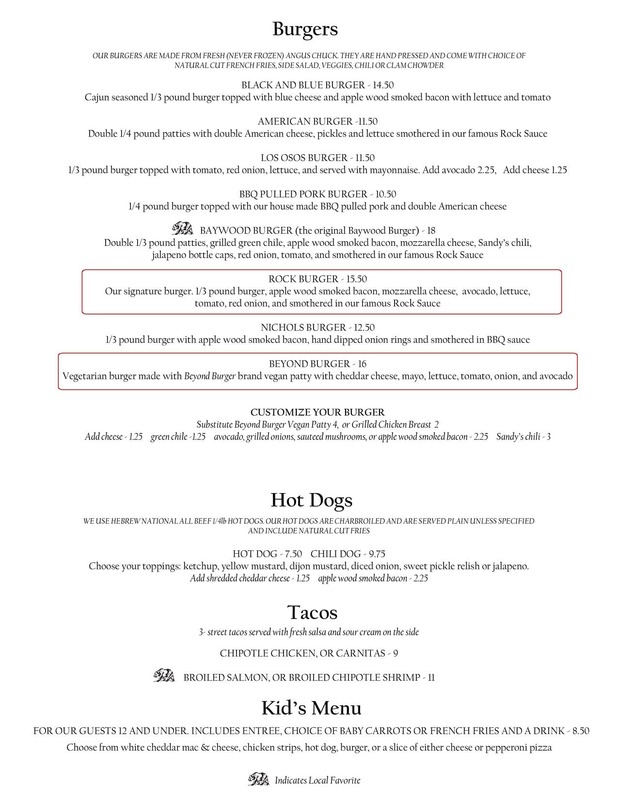 Our hot dogs are charbroiled and are served plain unless specified and include natural cut fries. Choose your toppings: ketchup, yellow mustard, dijon mustard, diced onion, sweet pickle relish or jalapeño. 3 street tacos served with fresh house made salsa and sour cream on the side. Choose from our traditional crust, thick crust, or thin crust. Our crust is naturally vegan (no dairy, no egg). Vegan cheese- 2. Nichols pizzas come with traditional sauce. Substitute White or BBQ at no additional cost. Optional sauce choices at additional cost are: Rock, Pesto, Garlic, Buffalo, Ranch-Pesto, Thai, or Hippie. Toppings: Pepperoni, Sausage, Linguica, Tomato, Salami, Meatball, Apple Wood Smoked Bacon, Broccoli, Cauliflower, Red Onion, Green Onion, Green Bell Pepper, Mushroom, Olive, Pineapple, Jalapeno, Minced Garlic, Fresh Garlic, Artichoke, Chicken, Sun Dried Tomato, BBQ Pulled Pork, Anchovy, Shrimp, Fresh Basil, Fresh Spinach, Canadian Style Bacon, Avocado (additional charge). Gourmet pizza as a calzone. BBQ sauce, BBQ Pulled pork, red onion, tomato, and pineapple. Pepperoni, Canadian bacon, sausage, red onion, bell pepper, olive, pineapple, and mushroom. Canadian bacon, sausage, red onion, and pineapple. Salami, pepperoni, Canadian bacon, and sausage. Linguica, pepperoni, sausage, olive, red onion, tomato, and bell pepper. White sauce, fresh spinach, mushroom, red onion, bell pepper, and feta cheese. Red onion, bell pepper, tomato, artichoke, pepperoni, and sausage. Traditional red sauce, vegan cheese, broccoli, cauliflower, and artichoke. Pesto sauce, sun-dried tomato, red onion, artichoke, and chicken. Buffalo sauce, chipotle seasoned chicken, sausage, apple wood smoked bacon, linguica, jalapeño, red onion, and red pepper flakes. White sauce, mushroom, red onion, fresh garlic, and chicken. Mushroom, red onion, bell pepper, olive, tomato, and artichoke. Our gluten free crust is made in house with a recipe developed by Darren to ensure it tastes like traditional pizza crust. Gluten Free Toppings: Fresh Basil, Fresh Spinach, Sun-dried tomato, Green Bell Pepper, Broccoli, Red Onion, Green Onion, Mushroom, Olive, Tomato, Cauliflower, Pineapple, Jalapeño, Minced Garlic, Shrimp, Fresh Garlic, Artichoke, Pepperoni, Bacon, Salami, BBQ Pulled Pork, Chicken, Canadian Style Bacon, Apple wood Bacon, Avocado (additional charge), and Vegan Cheese (additional charge). *Please do not ask for toppings not on this list as we will not put them on gluten free pizza crust. This is to ensure the safety of all our gluten intolerant or celiac guests. Please be respectful of this policy. Salami, pepperoni, Canadian bacon, and chicken. 12"
White sauce, fresh spinach, mushroom, red onion, bell pepper, and feta cheese. 12"
Pepperoni, Canadian bacon, red onion, bell pepper, and mushroom. 12"
Rancho-pesto sauce, green onion, tomato, olive, feta, and chicken. 12"
BBQ sauce, BBQ Pulled pork, red onion, tomato, and pineapple. 12"
Mushroom, red onion, bell pepper, black olive, tomato, and artichoke. 12"
Pesto sauce, sun dried tomatoes, red onion, artichoke, and chicken. 12"
White sauce, mushroom, red onion, fresh garlic, and chicken. 12"
*Our fries are gluten free however they are cooked in the same oil as our battered food- if sensitive, it is not recommended. 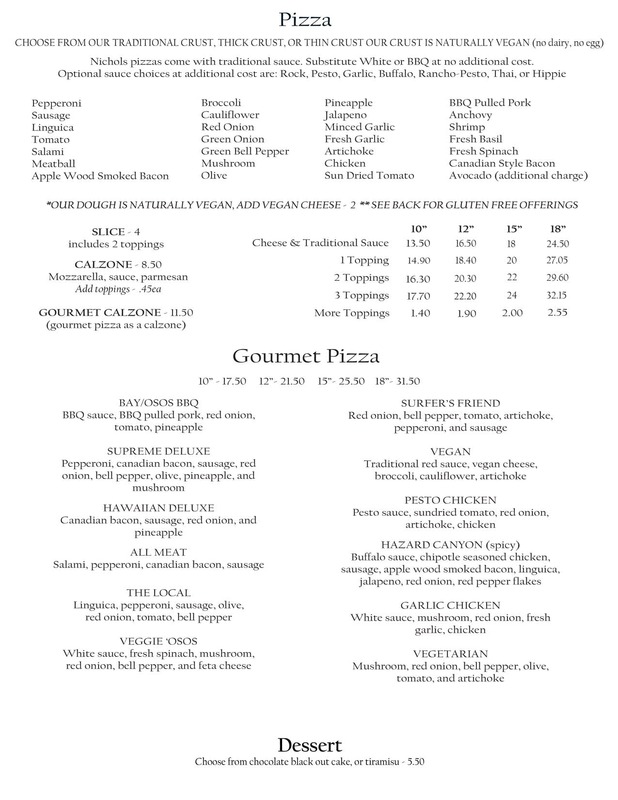 Nichols Pizza N Grill is proud to offer a quality Gluten Free Pizza. After experimenting with different pre-made gluten free pizza crusts, we were dissatisfied with the overall experience our customers would have with the "cookie-cutter" items on the market. We spent months experimenting with recipes of our own and are proud to be able to serve our own Gluten Free Pizza on our own Gluten Free Dough, which we feel is a very good representation of traditional pizza. We are careful and have procedures in place to reduce the risk of cross contamination. We "slap our regular dough with Gluten Free flours to reduce the risk of airborne flours contaminating our Gluten Free offerings. Our prep area is sanitized prior to the production of our Gluten Free Dough. 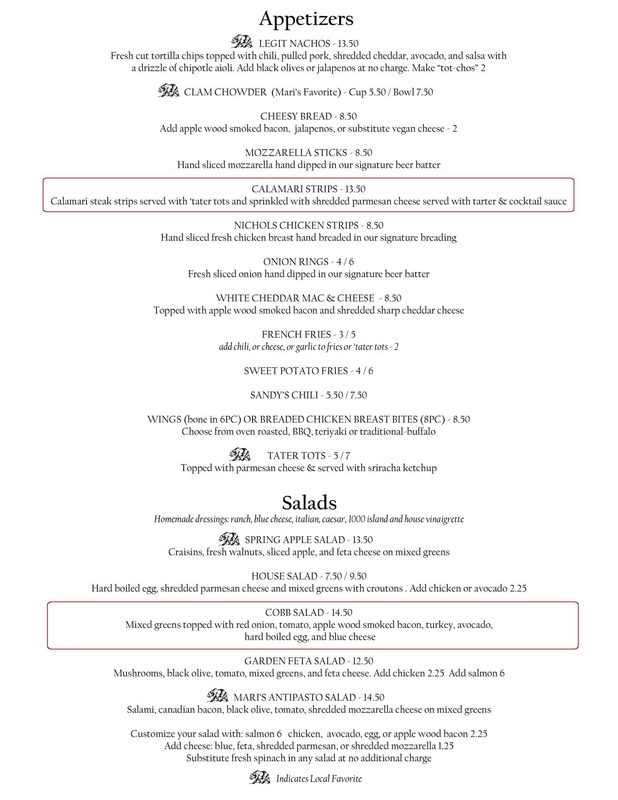 We have taken all measures possible with our suppliers to ensure we are not using products in our Gluten Free menu items which may contain Gluten or have been exposed to Gluten. In addition, when a Gluten Free item is ordered we stop production and sanitize the line prior to making the Gluten Free item. *Our recipe does include dairy. 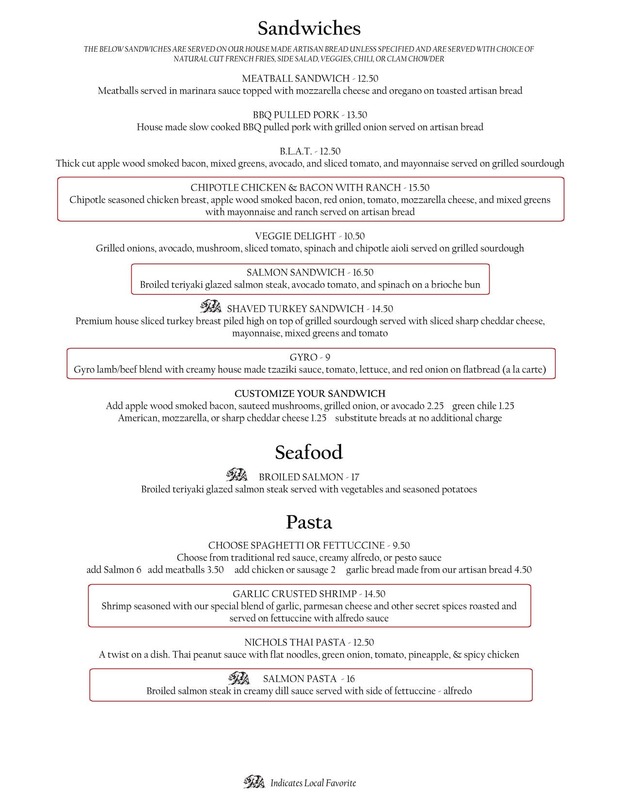 The below sandwiches are served on our house made artisan bread unless specified and are served with choice of natural cut french fries, side salad, veggies, chili, or clam chowder. Meatballs served in marinara sauce topped with mozzarella cheese and oregano on toasted house made artisan bread. House made slow cooked BBQ pulled pork with grilled onion served on house made artisan bread. Thick cut apple wood smoked bacon, mixed greens, avocado, sliced tomato, and mayonnaise served on grilled sourdough. Chipotle seasoned chicken breast, apple wood smoked bacon, red onion, tomato, mozzarella cheese, and mixed greens with mayonnaise and ranch served on house made artisan bread. Grilled onions, avocado, mushroom, sliced tomato, spinach and chipotle aioli served on grilled sourdough. Broiled teriyaki glazed salmon steak, avocado, tomato, and spinach on a brioche bun. Premium house sliced turkey breast piled high on top of grilled sourdough served with sliced sharp cheddar cheese, mayonnaise, mixed greens and tomato. Gyro lamb/beef blend with creamy house made tzaziki sauce, tomato, lettuce, and red onion on flatbread (a la carte). *Substitute bread at no additional charge. Broiled teriyaki glazed salmon steak served with vegetables and seasoned potatoes. Choose from traditional red sauce, creamy alfredo, or pesto sauce. Shrimp seasoned with our special blend of garlic, parmesan cheese and other secret spices roasted and served on fettuccine with alfredo sauce. A twist on a dish. Thai peanut sauce with flat noodles, green onion, tomato, pineapple, and spicy chicken. Broiled salmon steak in creamy dill sauce served with side of fettucine- alfredo. 1/2 or Full sandwich meal includes choice of soda, tea, or SLO Roasted coffee and fries, or side salad, or veggies. Enjoy a 1/4lb Hebrew National all beef hot dog with your choice of toppings as well as a fountain drink. Choose your toppings: ketchup, yellow mustard, dijon mustard, diced onion, sweet pickle relish or jalapeño. Slice of pizza with your choice of 2 toppings from our pizza menu, & fountain drink. 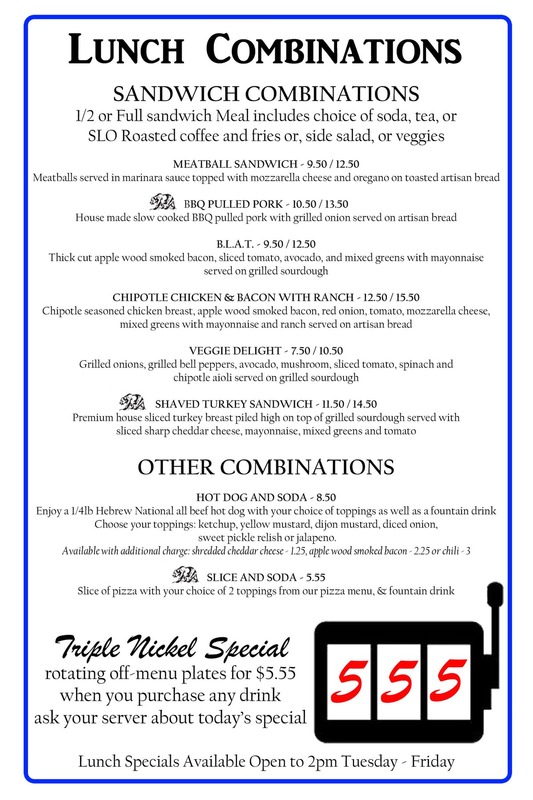 Rotating off-menu plates for $5.55 when you purchase any drink. Ask your server about today's special. Choose from white cheddar mac & cheese, chicken strips, hot dog, burger, or a slice of either cheese or pepperoni pizza.